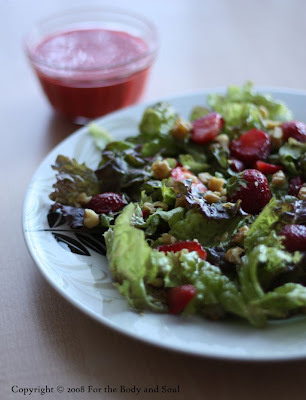 Today’s recipe is a quick and easy salad made with juicy strawberries, crunchy lettuce and walnuts drizzled with delicious strawberry dressing. Even though made with strawberries and honey, the dressing isn’t sweet. The salad is light and refreshing, perfect for warm summer days. I sprinkled my salad with chopped walnuts, but you can also use hazelnuts (either chopped or whole), sunflower seeds, or pumpkin seeds if you like. Wash and dry the lettuce, if the leaves are big, tear them into pieces. Slice half of the strawberries. Toss in the lettuce leaves. Divide the salad into 4 plates. Sprinkle each portion with chopped nuts. To make the dressing, combine the remaining strawberries with the white wine vinegar, olive oil, honey, salt and pepper in a blender or food processor. Process until smooth. Pour the dressing over the salad. I love fruit on savory salads. Do you like Canada? My sister is interested in moving there someday. I was looking for a strawberry salad and stumbled upon your blog. Thanks for sharing!